Radiation Measurement System is built around the Radiation Counter and GM tube along with different types of radioactive sources and absorbers to study the characteristics of radiation, background radiation, Gm’s operation and the interaction of radiation with matter. 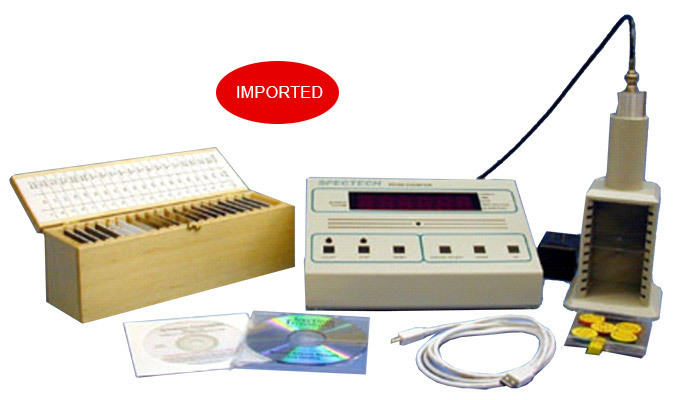 The radiation counter includes the features of a preset time function, a digital rate-meter with audible beeper and alarm and digitally controlled high voltage supply and computer interfacing via USB cable. Operation may be as a stand-alone station or directly from the computer when used. Data files are saved in spreadsheet compatible format for importing in most common spreadsheets allowing the student to perform calculations and graph the results for printing. The Radiation Counter is equipped with upgraded high voltage and an internal pre-amplier allowing operation with optional scintillation detectors for gross gamma counting. Cat. No. Item Name Qty. Exp. No. SPECIFICATIONS Inputs : BNC connector - Accepts standard Geiger tubes. : MHV connector - Accepts scintillation detectors. High voltage : 0 to +1200 volts @ 0.5mA. Modes : Counts; Elapsed Time; Preset Time; Count Rate (counts per second); High Voltage Level; Alarm Level; Speaker Volume. Audio : Includes an audio indication of radiation events and a programmable audio alarm. *Caution : Use only the AC adapter included with the SN615. Using a different adapter can damage the unit and void the warranty. SPECIFICATIONS GM35 GM Probe : 35mm end window with BNC connector. SPECIFICATIONS This set of 20 calibrated radiation absorbers covers the range from 4.5 to 7400 mg/cm2 and consists of aluminum, plastic and lead plates. The absorber are 2.75”x2.75” and are designed to fit all Spectrum Techniques detector stand assemblies. Capacity : Holds up to 20 1" discs. Outside Dimensions : h=3.6" x 2.25"
Interior Dimensions : h=2.65" X 1.25"
This LSD5 lead shield container is suitable for higher activity gamma sources. Computer (not supplied with the setup). Isotope generator for half life experiment.